It's possible to put heat transfer vinyl on hats with a regular heat press, but a heat press makes it much, much easier (and safer!). 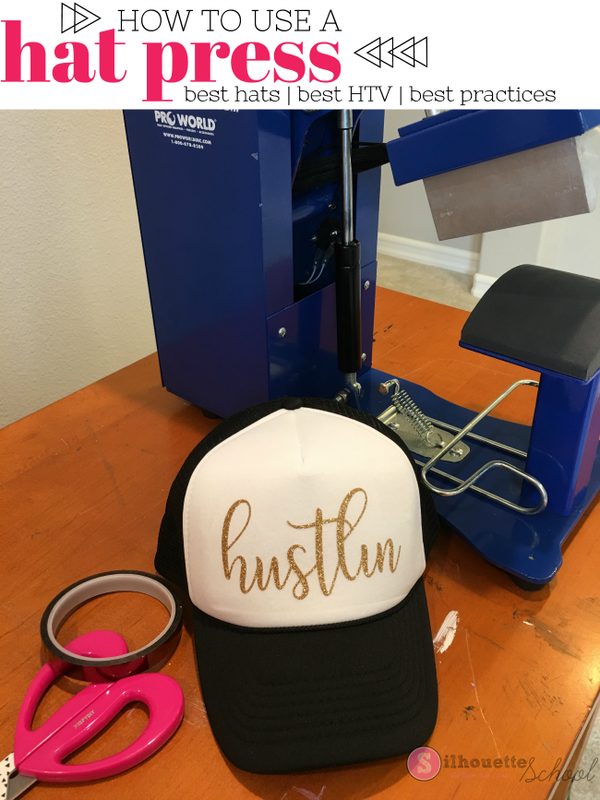 Today I thought I'd share a beginner hat heat press tutorial with you so you can see just how easy it is to heat one. The first thing you want to do is unpack your hat press and make sure to remove all packing materials and zip ties. Set it up on a solid surface and plug it in. The power button is on the right side with the controls on the top. The time and temperature will be determined by the type of heat transfer vinyl you are applying. Once the temperature is set, press the Set button again to lock it in. It should now say P-2. Again, press the up and down arrows to set the time. Wait for the press to come up to temperature. The manufacture says this will take about 20 minutes, but I timed warming it up at least three times and it was closer to 5-7 minutes. The easiest hats to use with a cap heat press are 5 panel hats rather than 6 panel hats. Five panel caps do not have a seam down the front center of the hat making it easier to press onto the large front panel. Six panel hats split the front panel of the cap into two sections putting a seam right down the middle - making it more challenging to press onto the cap. If you are using a 6 panel hat, a thicker heat transfer material such as glitter heat transfer vinyl or Flock HTV ideal for pressing over the thick center seam. You can press onto cotton or twill hats, polyester hats, and foam and mesh trucker-style hats to name a few! Measure the front panel of the blank hat and then decide how big you want your design to be. Measure again...you don't want your design to be too big. Ask me how I know... For an adult hat, I think about 5-6" across is perfect. 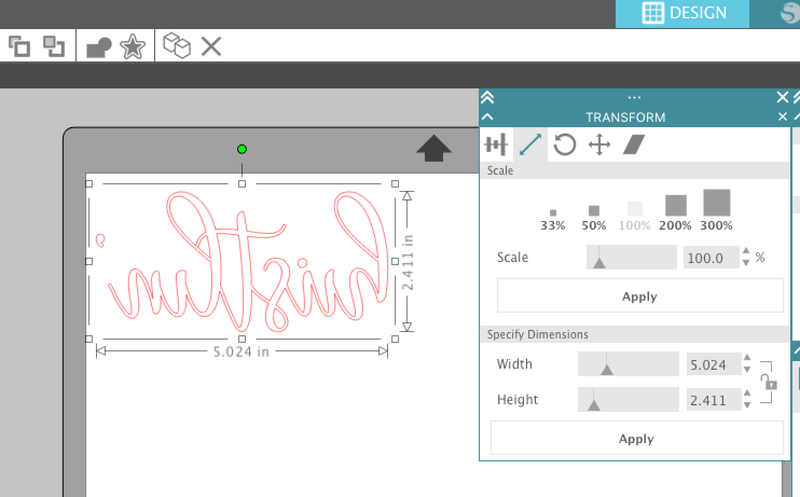 In Silhouette Studio scale the design using the corner of the selection box or by manually typing in the dimensions in the Scale tool (found within the Transform panel on the right sidebar). Cut the HTV with your Silhouette machine while the hat press warms up to the correct temperature. If you need a refresher on how to cut heat transfer vinyl, check out this beginner tutorial. Place the HTV vinyl decal onto the hat before you put it onto the press. To keep it in place, use some high heat tape (also available at Pro World). To put the hat on the Trans Pro Semi Auto Cap heat press, start by looping the back of the hat around the metal hat holding device. Then stretch the hat onto the rounded heating board. The bill of the hat should be pointing up. Make sure the sweat band of the heat is flipped forward so it's not adding extra bulk while pressing. I actually skipped the teflon sheet, but there's no harm in using one while pressing. Pull the handle down until it locks. The timer should start counting down. When it reaches the end of the pressing time, the Trans Pro Semi Auto cap press will automatically release and lift the handle. I have to say I love this feature! Peel away the clear carrier sheet from your heat transfer vinyl and you're done! If you want to add HTV to the brim of the hat, flip the hat around and place the brim on the heating board and apply heat and pressure. If you're looking for an easy to use hat heat press I would definitely recommend the Trans Pro Semi Automatic Cap press from Pro World. It's easy and fast to use and leaves you with a quality professional-looking custom hat!